With the Internet building bridges across all the places in the world, we’ve decided to use this opportunity to connect with other people and businesses in our industry, and to find out more about how professional carpet cleaning is done in other countries. So today’s blog post is about one of our favourite carpet cleaners, Robert Atlas from Phoenix, Arizona. 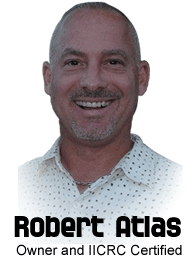 Robert Atlas is the owner and manager of Phoenix Carpet Repair, AZ, USA. What we like about Robert and his company, Phoenix Carpet Repair and Cleaning, is that he’s a real professional dealing with carpet repair, stretching, and all other damage related issues. We also like that he’s involved with the daily running of his company, so his customers won’t get an impersonal service from a nationwide chain that only looks at numbers instead of customers. So we’ve decided to ask Robert some questions to find out what his work involves, and how they clean carpets all the way over in the great State of Arizona. What services does Phoenix Carpet Repair & Cleaning offer? We offer carpet repair and re-stretching, carpet cleaning (truck mounted, or low moisture), and we also clean upholstery, area rugs, and tile & grout. The truck mounted system we have is Prochem, which is one of the best machines available for carpet cleaning. We have also handled some Antique area rugs that have value of up to $20,000. What’s the largest job you’ve ever undertaken? The largest job we ever took was for the Phoenix Convention Center. It was a 20 hour job for 2 technicians. They had a large flood, seams had popped and they were having trouble finding someone to take on the job. I think our service reviews are the thing I am most proud of. My company has around 900 five-stars on the internet. I run my company the way I do because I don’t want to just be another carpet repair or cleaning service the customer will never remember again or even want to call again. I want to provide a level of service that they will remember and will call back time and time again for life. What is the weirdest mess you’ve ever been called in to handle? 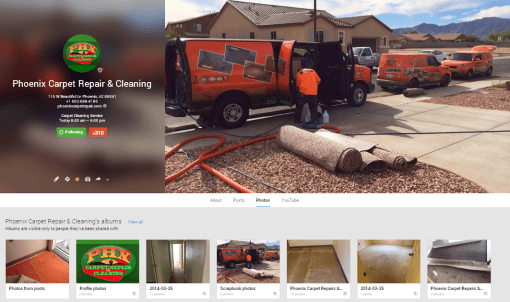 The Phoenix, Arizona company also keeps an updated before-after image gallery on their Google Plus page. About three years ago as an individual contractor I was called by a woman whose house was being inspected the following day. She had four pet ferrets and, in her home, she had so much stuff it was piled from floor to ceiling and had one pathway through her house. The ferrets had soiled the floors for an extended period of time and the path of carpet in the hallway needed replacing. I cut and pulled out the contaminated carpet and pad and installed new carpet. 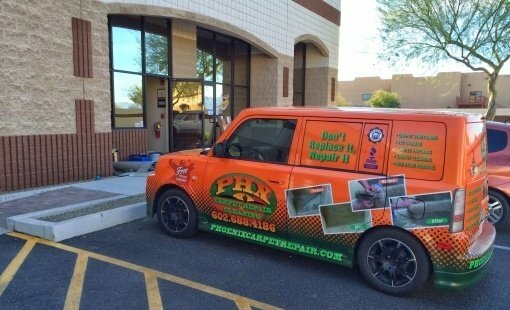 We’re based at 115 W. Beautiful Lane, Phoenix, AZ 85041 (see it on Google Map), and you can contact us by (602) 688-4186 or by visiting our Phoenix Carpet Repair web site or our Facebook page. How far away from us are you?